Data alone isn’t something that will change people’s mind when it comes to their teaching practice. But, nonetheless, in 2010 when I transitioned to a new school and district, I decided I would collect data, if for no other reason, to convince myself that my efforts to make language classes more accessible to more students was paying off. Initially I worked by myself. I put myself out there, contacting registrars, requesting enrollment data. I put in many hours trying to analyze the enrollment figures to determine just how many students we were retaining in our program, as it existed at the time. Patterns emerged – the patterns you would expect and that are substantiated across our country. Males (especially blacks) were underrepresented at upper levels. Females (especially high achieving, white females) were overrepresented at upper levels. 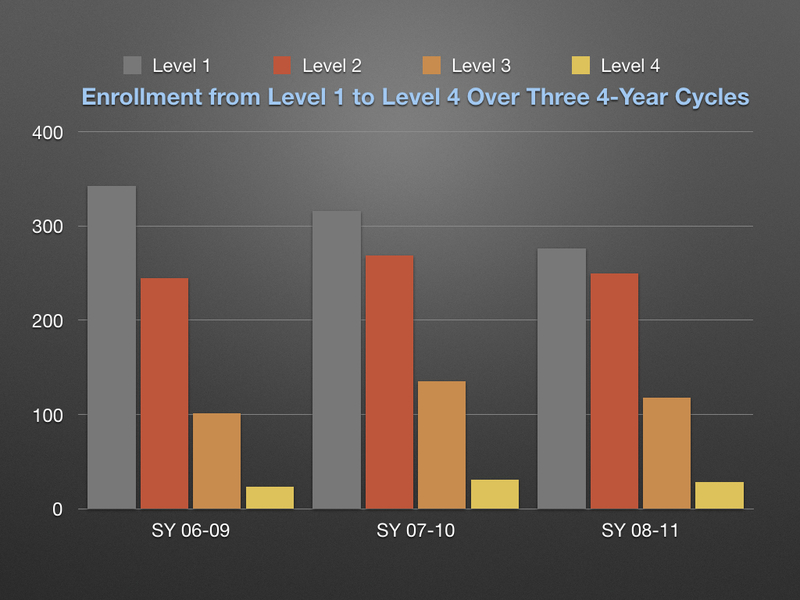 Over three separate (but consecutive) 4-year cycles, the enrollment pattern was essentially the same. Of the 300 some students who enrolled in Spanish level 1 as freshmen fewer than 30 remained as seniors. When I looked at this data along racial lines, another pattern emerged. Of the roughly 35 black students who enrolled in level 1 as freshmen, only one remained by level 4. “Some” students just aren’t interested. “Some” students are better at languages. “Some” students aren’t language learning material. “Some” students would rather take other classes. “Some” students just don’t care. With real enrollment data in your hands, a person is better prepared to discuss what’s working… and for whom. Is it really true that some kids just aren’t interested? If it were, you might see fluctuation from cycle to cycle as more boys choose to stay in or more students of color choose to continue studying a language. 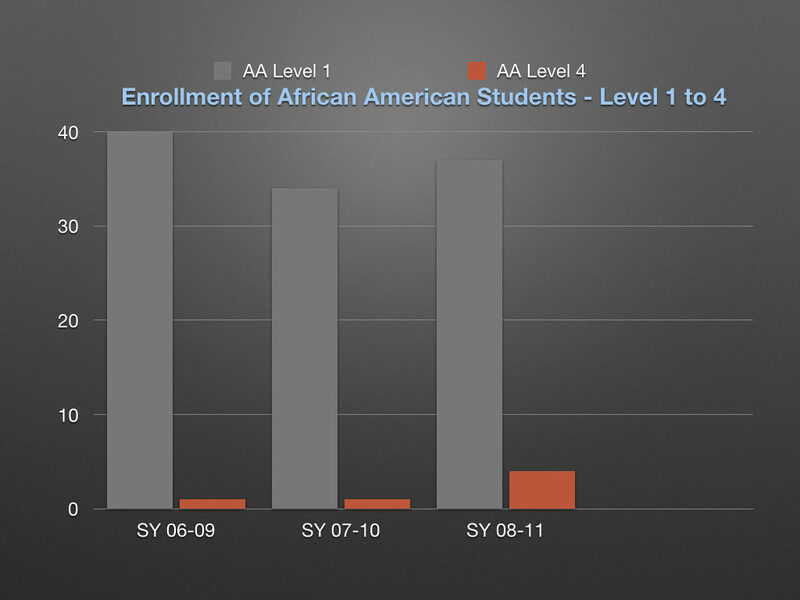 You would see variation in enrollment patterns that simply doesn’t exist in the graphs above. Is it really true that some kids just aren’t cut out for learning languages? If that’s the argument, are we comfortable saying that males can’t acquire a second language as well, as easily or as successfully as females can or, even more to the point, that African Americans can’t acquire language as well as high achieving white females? You’ll have to answer that question for yourself. I know where I stand. I believe that ALL humans are designed by nature to acquire language. As such, there is no natural reason for these demographic differences to persist IF we are teaching in ways that work for all our students. Like I said, data alone is not likely to change a person’s practice. But if you, like I, BELIEVE that any human can acquire language (and 99.9% of the human race routinely and regularly do) then I propose to you that we NEED to change our practices. If we teach in ways that are more brain compatible – i.e. by emphasizing comprehension first, by emphasizing and valuing interpretation of language before asking for production of language, by learning to be our students’ conversation partner, by practicing delivering compelling, comprehensible messages to their eyes and ears – then more students will enjoy language class and will self-select into upper classes and more students will achieve higher rates of proficiency. Here are the results from my (now former) district. We began as a district to transition to CI in 2013 when we adopted a goal statement for the world language program (read about it here) that put comprehension first and proficiency for each student as the mission. We invited presenters to do in-services, we observed one another, we did book studies, we shared material, we attended (and even hosted!) the International Forum on Language Teaching and other professional development opportunities focusing on TPRS and CI Teaching. Prior to this, district teachers used mostly traditional methods and the textbook was considered the curriculum. The following slide compares students who chose to register for level 3 elective Spanish class. I chose to look at level 3 because it is the invisible gate keeper for competitive college. Most kids who don’t have 3 or more years of language study are going to be looking at state universities, while those who study longer have access to private, competitive schools. 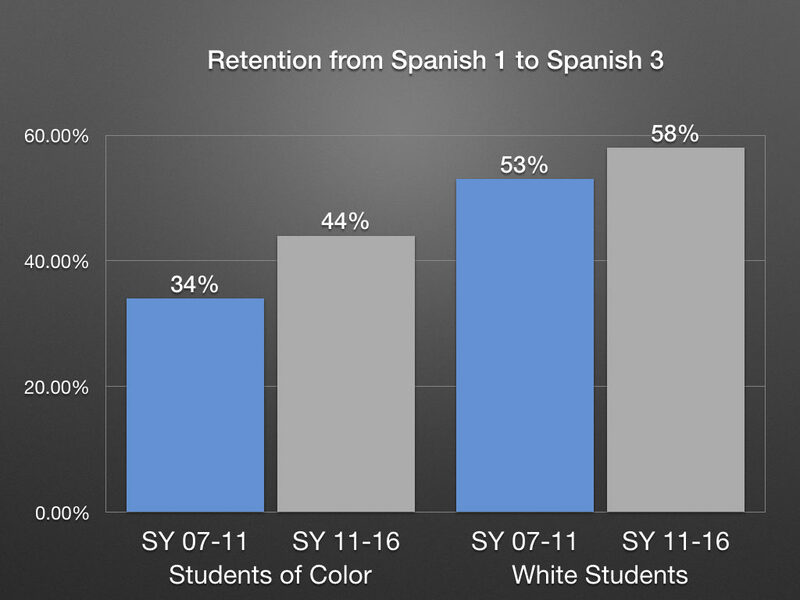 I worked with our district data person to isolate students in level 1 Spanish for each of the five years prior to me arriving in the district. Students were taught with traditional methods and the textbook was used as the curriculum. We tracked those students to determine which students voluntarily elected to enroll in level 3 as juniors or seniors. We eliminated from these figures any students who left the district or for other reasons would not have been able to enroll in level 3 (a junior in level 1, for example). We determined that the total percentage of students over these five years who were able to enroll in level 3 and chose to do so was 48%. Said another way: On average, 48% of students enrolled in level 3 under traditional methods. I began teaching level 1 in the district in 2010, prior to the larger district moving in the direction of CI. So, some of my level 1 students who experienced CI, transitioned to more traditional methods in level 2, though over time that certainly changed. We isolated students that had my level 1 CI class and tracked them to see how many would enroll in level 3. We found that those students who had a solid year of CI instruction in level 1 with a mix of traditional and new-to-CI-teaching in year two were more likely to enroll in level 3. 48% compared to 54%. EACH measurable ethnicity subgroup showed increases. Gender and race/ethnicity information was obtained for students whose first opportunity to enroll in Spanish level 1 as 9th graders taught using traditional methods from the 2006-2007 to 2010-2011 school year and students whose first opportunity to enroll in Spanish level 1 as 8th graders which was taught using TPRS methods from the 2010-2011 to 2016-2017 school years. 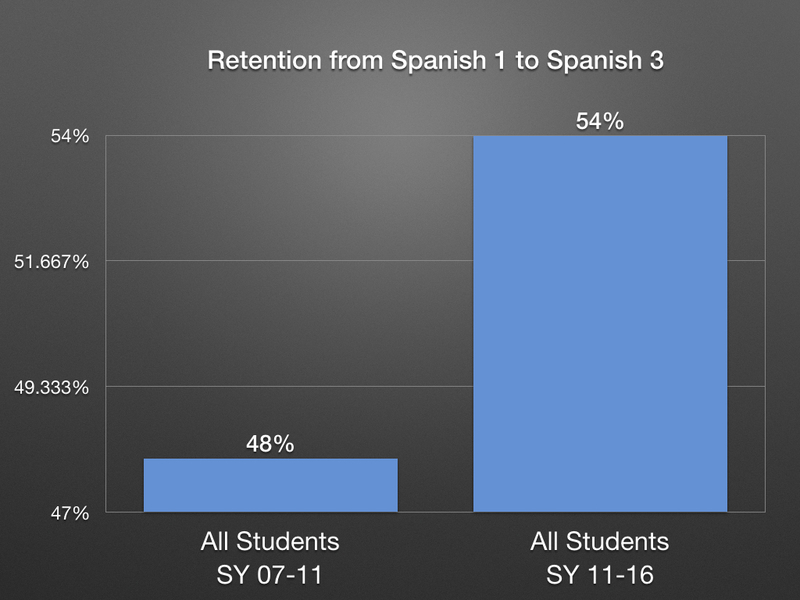 Student enrollment in Spanish level 3 two, three and four years after enrollment was compared to student enrollment in Spanish level 1 to determine retention rates. To determine if a significant relationship exists between between teaching methods used in Spanish level 1 and retention into Spanish level 3, the Chi-Square test of Independence is used. It is true that there are more variables at play and it is impossible to prove beyond a shadow of a doubt that the comprehension-based approach is solely responsible for these increases in enrollment. However, we know that where CI is taking hold, enrollment is rising. Here’s one dramatic example: Bob Patrick, the 2017 keynote speaker at the Comprehensible Midwest conference, highlighted his experience over the past 12 years teaching Latin in the most largest, most diverse school district in Georgia. He took over a dying Latin program with less than 1% retention over four years. Now, 12 years later, his school boasts 5 full-time Latin teachers. They have documented a 65% retention rate from first year to fourth. And, most importantly, the demographic breakdown of upper level students MIRRORS the diverse make up of the school’s student body. We know this is true. It’s happening all over. And – if – there may be a better way to do things – a way that will increase the number of students studying in your program – a way that will work for all types of kids in your school – a way to equalize opportunity for your school and our society – a way to make language learning an inclusive experience rather than an exclusive one – a person has two choices: criticize the approach or embrace it and dedicate 3 or so years to learning about it, getting better at it and measuring the results in your own teaching and your own students. What would the teacher with the growth mindset do? Part 2 of this blog post will focus on achievement. Look forward to it. It’s pretty astounding. I want to publicly express my immense gratitude to my colleague and friend, Khrisslyn Goodman, for her fantastical, statistical assistance with this enrollment study. Fantastic job, Grant! Thank you! Do you happen to know how many Latin teachers were in Bob Patrick’s district before he came there? Hey Mark! Great to hear from you! Yes, I do know how many there were. This is great stuff. Thank you for your passion for helping people of color to access the educational system. I’m sure these students are more successful in their other classes as a result of being successful in Spanish. I was inspired by this article and suspect there are similar patterns at my current district. I’ve even gotten the go-ahead to looking into it and I’m trying to formulate a clear email to our enrollment person. I want to follow your model of Spa 1 to 3 over the course of 5 years. How did you deal with sophomores who enroll in Spanish 3? Do you only look at those who start Lv. 1 as freshman and enroll in 3 as juniors? Hi Dylan, thanks for your comment. I suspect you are right. This is why it’s so urgent for us to find ways to document this and for it to be shared. I will venture a guess that one email will not be enough to fully clarify and articulate what you’re after. I suggest you get the person’s attention and give a general idea of what you’re after and follow up face to face. If your enrollment person wants to talk with me or the enrollment person who created the filters, let me know. I’m sure she saved the filters and would be willing to share. Best of luck and report back what you find! Hi Grant. I just started a new position in August 2017. I had 17 students signed up for French one after a quarter of exploratory French in sixth grade. This year, after teaching that exploratory sixth grade using comprehensible input, I have 48 rising seventh graders in my French one next year. 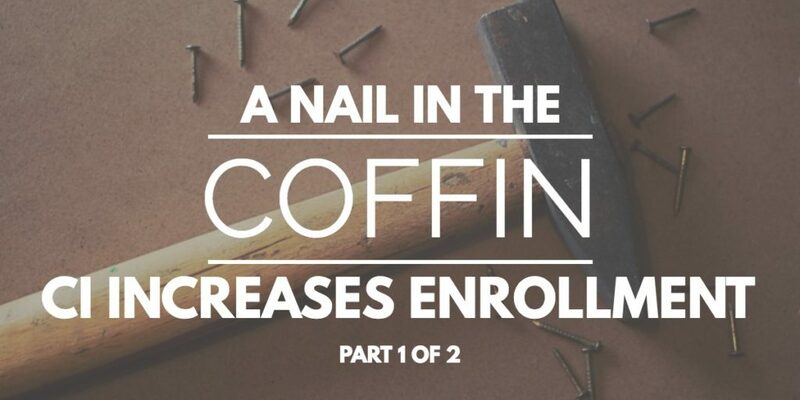 You are absolutely right – CI increases enrollment! Languages give us a means to connect and break down barriers. It provides expanded academic and economic opportunities. Moreover, this demonstrates the amazing untapped potential in youth and the incredible impact enthusiastic, creative, caring, motivated teaching professionals can have in the lives of young people! Thank you for the data-informed inspiration! Thank you for your message Maureen!